As anything really old you will find in Milano, you will discover many things have been built on top of it, added onto it or “restored” over time. This multitude of different building styles however adds a unique feel to the monuments as you will find at the Sant Ambrogio Basilica complex: every époque in combination with their saints and rulers have left their mark. In the case of Sant Ambrogio, the first stone was set as early as 375 AD. Despite all the changes done throughout the following centuries, the basilica is one of the most important buildings from the Lombard Romanesque style (everything is very well described at the site, even in English). Although the most significant pieces are the altar (with the somewhat freaky leftovers of Sant Ambrogio himself underneath), the carved wooden entrance door and the marble sarcophagus, I love the most the hidden details. Look carefully at the column heads, lose yourself in an uncountable variety of symbolic animals, imaginary beasts and monsters. In front of the Sant Ambrogio monastery (located next to the Basilica) you will find yet another brand new city project (completed in July 2014), the piazza Sant Ambrogio. In between the peacefulness of the Sant Ambrogio monastery and the pedestrian piazza, one could easily imagine living in a flat behind one of its beautiful facades. 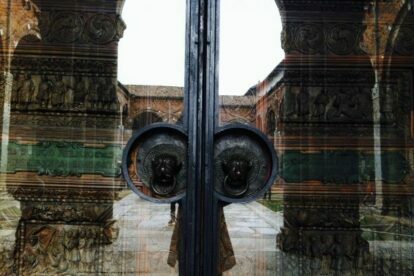 Tip – don’t miss looking up at the right corner of the Basilica central gates, you will find a hilarious creature staring right at you.